How Unilever helped consumers adopt a product that is better for the environment. Consumers are generally overdosing fabric conditioner due to the preconception that more product means more fragrance and freshness. Buying and using products more often than needed results in a higher impact on the environment: more water, packaging and GHG emissions. Consumers do not want to sacrifice the quality, freshness and fragrance of the product for sustainability. They want the best of both worlds without any compromise. 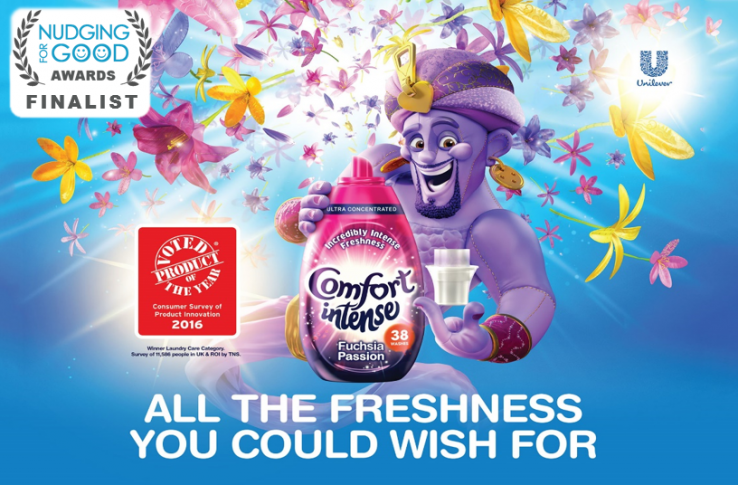 Comfort Intense is Unilever’s ultimate concentrated fabric conditioner with a smaller dosage than the average product on the market. With this new range, we challenged the current behaviour of overdosing, whilst offering a more powerful fragranced product. We did so by fully changing packaging to frame that consumers do not need to use large amounts of fabric conditioner. The new 3D pack in the shape of a droplet with a smaller cap is demonstrating to the consumer how little of the product they need to use in order to get the fragrance and freshness they demand. We also used framing in the product range name: “Intense”, which serves both as a fragrance claim, as well as concentration. The “concentration” message alone is not a driver for consumer choice and behavioural change. By improving the performance of the product, on top of the concentration work, we gave consumers a real reason to adopt our new product. The message we conveyed was easy to understand and the smaller cap (15ml compared to 35ml) made it effortless and subconscious for consumers to change their behaviour. Our communications on both digital and in-store explains to our consumers the value of the product. With the smaller pack, we have made it easy for consumers to realise significant sustainability savings, such as a 50% reduction in water, 33% reduction in waste and a 28% reduction in GHG compared to the rest of the Comfort range with 35ml dosage. It also benefits the consumers by decreasing the storage space required, as well as the plastic recycling. We are on the path of achieving our ambition to convert all concentrated users to ultra-concentrates.